Distilling a highly successful powerboat racing career into a luxury day boat, hull designer and boat builder Jeff Hunton has come up with another winning formula. Just prior to the brand’s recent launch in the US we joined him for an afternoon on board his famous XRS 37. As a professional boat tester, I have driven some strange and outlandish craft over the years, from marinized cars and amphibious RIBs to bold, experimental prototypes of every size and shape. As you might imagine, it has been great fun examining the various attempts by boat builders to reinvent the wheel, but the fact of the matter is that reinvention is rarely necessary. Water behaves much today as it did a million years ago, so the best recipe for unfettered powerboating pleasure is remarkably straightforward. It’s not about radical ingenuity or bold tangential design; it’s simply about a well-established hull with proven credentials from a trusted and diligent boat builder who cares about his work – in other words, a brand exactly like Hunton. When the company was founded in 1979, Jeff Hunton’s racing experience on long, fast, offshore passages quickly earned him a reputation as a builder of ferociously capable sea boats. After taking the title in 1980 with his very first design, Jeff would go on to win the British Offshore Powerboat Championship no fewer than six times. It was an extremely auspicious beginning for Hunton Powerboats but it would be wrong to imagine that a Hunton is simply a pared back speed machine. On the contrary, while they retain the same hull shapes and calibre of build that helped forge their name on the race circuit, Jeff has always endeavored to combine that traditional high-end performance with unstinting luxury, craftsmanship and aesthetic appeal. It’s a very compelling ethos and one that remains very much in evidence on today’s XRS 37. 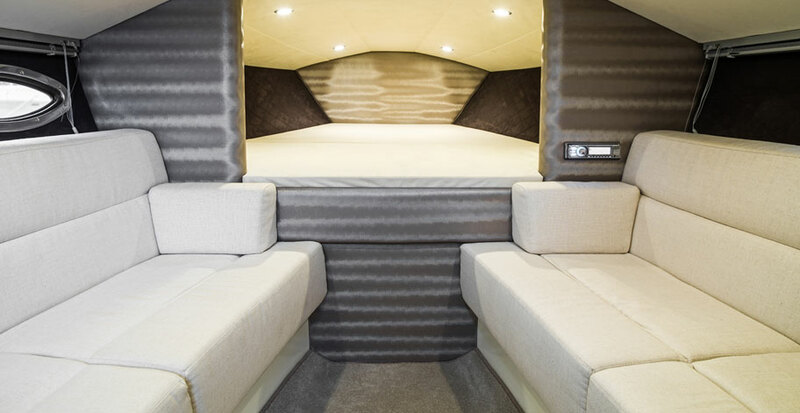 The XRS 37 might fall into the ‘Express Cruiser’ category, but the provision of a cabin should not tempt you to judge it by the general standards of that sector. While a great many sports cruisers are plump, blunt-headed people-carriers, with flabby topsides bulging over their rubbing strakes, the Hunton takes a very different approach. Here, handling dynamics are evidently prioritized over the needs of accommodation – and just a quick glimpse of that long raked bow, with its radically tapering beam, its fine entry and its flat, uncompromising foredeck, is tangible proof that this boat remains powerfully committed to the demands of high performance. Naturally then, when you head below decks, the cabin is quite compact. It comprises a day space with a galley to port and an enclosed heads compartment to starboard, plus an elevated double berth in the ‘V’ of the bow. Both the breadth and the headroom are relatively limited, but what you do get is a long, sheltered space in which every spare inch is used to the utmost. You also get plenty of natural light, clean, uncomplicated lines and a palate of high-grade materials that is as attractive as it is understated. Back up at the helm, the overriding importance of the driving experience is again obvious. 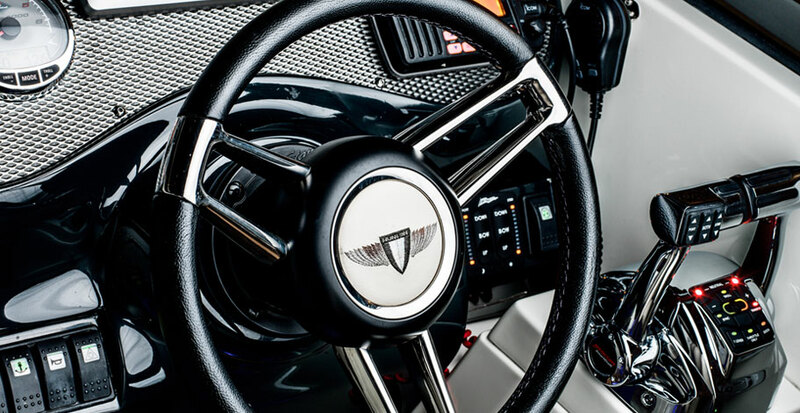 The knurled aluminum dash plate is a treat to behold, and so too is the thick stainless screen rim and the deeply padded upholstery – but it’s the quality of the helm position itself that really hits home. It possesses a level of natural, ergonomic effectiveness that can only be achieved through long and committed periods of on-water testing. The leaning post, the foot brace, the wheel, the throttle, the screen, the dash and the forearm resting point for your throttle arm – all are as close to perfect as you could want. The upright seatbacks wrap reassuringly around your body and the controls rest perfectly to hand, leaving you free to look ahead through the raked, tinted screen, at an exquisite view of that long, waspish foredeck, thrusting out toward the horizon like an ocean-cleaving blade. If you can bear to tear yourself away from the excellent helm and inspect the rest of the cockpit, you will discover that even in its ‘standard’ format, the XRS 37 remains one of the most bespoke feeling boats around. Even behind the scenes, at the back of the dash and beneath the engine lid, the details are obsessively ordered and lavishly executed. It might sound like overkill, but as Jeff explains, this almost neurotic fastidiousness is about much more than simply neatening up the aesthetics; it’s about building a boat to the same rigorous standards as the original race machines that define the company’s heritage. It is no surprise then that, wherever you look (from the matt silver hull to the teak trim, the sumptuous leaning posts, the Alcantara cabin lining, the bulbous air intakes and the curved steel cleats recessed neatly into their molded housings), everything is a pleasure to see, to feel and to use. the water with tremendous efficiency and all the while, you stand cocooned in the happy embrace of your leaning post, turning at pace, thundering through a seascape at 50 knots and marveling at just how soft and ingratiating a well-trimmed Hunton can be. There are plenty of very sage and grown-up reasons to love the XRS 37 – not least, the beautifully balanced hull, the excellent build quality and the obsessive attention to detail. But the real pleasure here is of an altogether less impersonal nature, because the XRS 37 is not just an entirely delightful experience; it’s also an intrinsically British one. Notwithstanding the uncomplicated potency of the boat’s profile, its aesthetics are self-effacing and modest; its design flourishes are restrained; and its enormous dynamic ability is not advertised with loud graphics or glittering gimimickry but with subtle suggestions born out of practical purpose rather than showroom appeal. Yes, if you were to consider the matter objectively, you would say this is a great boat with a small cabin and a couple of features the builders might want to tweak. But this is not an objective experience. This is a Hunton, coursing through with race DNA and sprinkled with the magical artisan pixie dust of the marque’s enduring appeal. 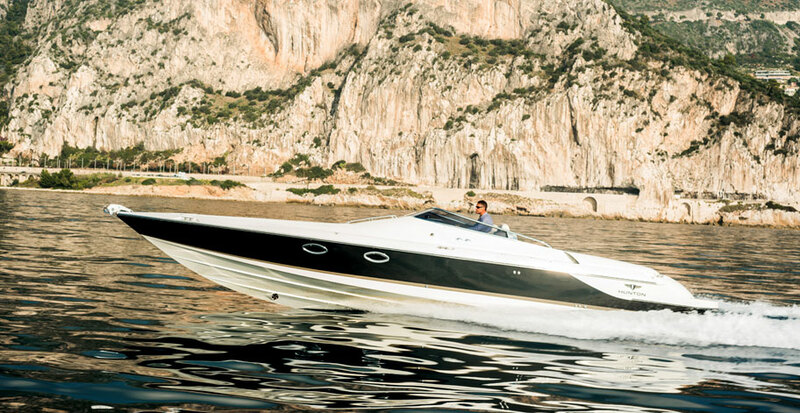 Certainly, it is fast, expensive and unashamedly high-end, but if ever there was a boat that could make the alternatives feel like false economy, the XRS 37 is it.